Last year was the 138th year of the Cape Town Cycle Tour 2016 that was shortened to 47 kilometres due to the impact of the huge fires that occurred in the mother city’s south peninsular. Welcome 2016, and the Cape Town Cycle Tour is back to its normal route 109km’s that includes Chappies ( Chapmans peak ). It all starts on Sunday, 6 March 2016 at the city centre, outside the Civic Centre. It travels along the M3 to Lakeside where you will then join Main Road which will take you through Muizenberg, Kalk Bay and Fish Hoek. From there you take the coastal road to Simonstown and then go past the entrance to the Cape Point Nature Reserve. You then continue to Scarborough and on to Oceanview, missing the Kommetjie Hill. Then its Chapman’s Peak and up Suikerbossie and along the coast to Greenpoint. 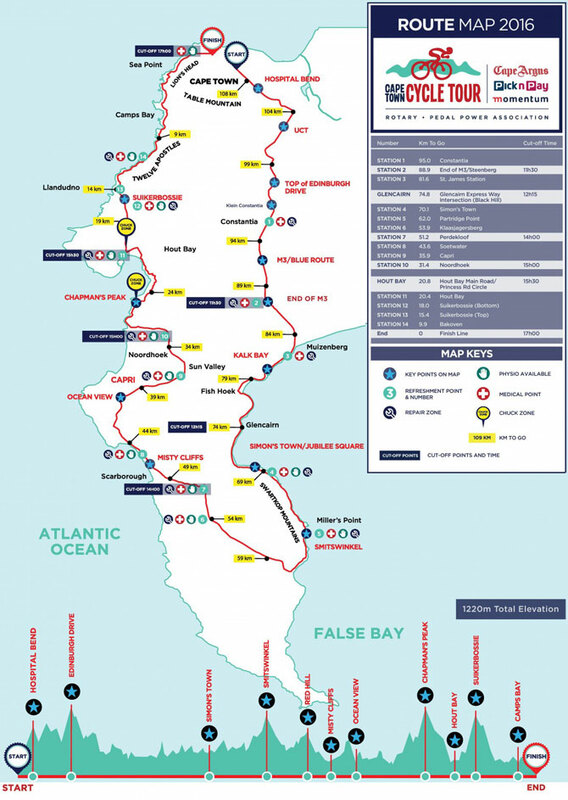 See below the Cape Town Cycle Tour 2016 route visual map around the peninsular, with key points, repair zones, refreshment points, medical points, available Physio stations and of course cut off times. The route needs to be completed within 7 hours of your group’s start time. Check out the FAQ’s for more info. The Cycle tour has an Expo at the Cape Town Stadium, Green Point, Cape Town where each Cycle Tour participant goes to collect their race pack and register. Check the Cycle tour Facebook page for news and images and connect your twitter for updates. For your tripping around travel needs, CABS car hire is your local Cape town and in Sea Point car hire. Heres hoping that the weather is great with a little wind, good luck to all the cycles and enjoy the big day.